When Godzilla entered Tokyo, size and power doomed those in his path. Clearly, massive carnage would follow in his wake. 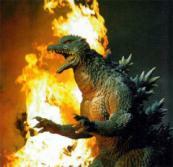 The housing market has its own Godzilla in the form of basic economics of supply and demand. When artificial props entered the United States housing market, in the form of sub-prime mortgages, abuse of stated income, zero down loans, and other creative products, a financial “Godzilla” appeared on the horizon. Massive carnage was destined to come. Prices have been falling since late 2006, and CoreLogic just released their report for 2011 that prices fell another 4.7%. This is in line with our 2011 predictions that, in spite of a prediction of a bottom by some housing experts, prices have more downside – and will continue to slide until natural market forces take hold. As we predicted in our forecast for the housing market in 2012, a deal has been struck between the state AGs and banks over the “Robo Signing” drama. So how will the settlement affect the housing market? Some say this represents a first step in attacking the 700 billion dollars-worth of underwater mortgages by reducing principle. Let’s take a look at this logic. The deal could rise to 30 billion from the current number of 26 billion if nine other servicers join the settlement. Five billion dollars of that amount will be paid out to American citizens who were affected by the robo signing scandal in the form of a $2,000 check. In an attempt to attack the 700 billion dollar problem of underwater mortgages. Ten billion dollars will go to reducing principle for those who are either delinquent or at risk of default. This equates to $17,000 -20,000 of principal write-down per person. Five years from now, it will be interesting to see if any of the home owners who receive this write down were ultimately able to keep their homes. Three billion dollars will be used to refinance mortgages holders whose homes are underwater. These items will give some assistance to those who qualify for this settlement. But will these actions do much to help stabilize home prices? No, they won’t. These steps will deliver about the same amount of punch as did the little tanks, planes and bullets brought to bear against Godzilla in his rampage. The size and magnitude of our housing crisis has to be respected by all parties in order to grasp what must be done to conquer its swath of destruction. To date, government has enacted a home buyer tax credit, spent trillions of dollars to bring mortgage rates down, implemented various refinance plans, and made many attempts to modify troubled mortgages. Did these actions stop the slide of prices? Will these new plans being rolled out in 2012 stop the slide and defeat our housing Godzilla? Godzilla is only defeated when legitimate and adequate demand appears, in the form of sensibly qualified homebuyers, to absorb the true supply still hidden in the shadows. When that time comes, the monster will be defeated and the housing bulls will be safe once more. Logan Mohtashami is a senior loan officer at his family owned mortgage company AMC Lending Group, which has been providing mortgages services for California residents since 1988. Much like you Logan, my opinions on this topic are strong and varied so I’ll try to be brief. First, the one thing I think that is “fair” and would be helpful in the way a tax cut is usually proposed to be helpful, is allowing these borrowers (I find it hard to call anybody who owes more the 50 percent of the value of the property a home “owner”…but that’s technical and legal discussion) to refinance their underwater loans/mortgages at the current rates. In so many cases the borrower was not speculating and didn’t look at their home as an investment but simply a nice place to live versus paying somebody else’s mortgage (renting) and hopefully having some equity, through principle paydown, after five, 10 20+ years. Many of these people had qualifying credit when they purchased and have qualifying credit today. The only thing standing in the way from refinancing into a considerably lower rate and a more “stable” term is that their house is worth less than what they owe (…if only it didn’t have to be appraised). Getting these borrowers rates from 6-8 (or higher) down to the current 30 yr fixed rates of 4-5 percent would be huge. In so many cases this would be at least a $100 in their pocket each month that could be spent elsewhere in the economy that would act as a stimulant and ultimately have an impact on our government’s ability to service and pay down debt and meet its obligations on so many levels. I’m not big on writing down principle just because your credit stinks and you’re underwater. If their credit is good and they qualify under current requirements they can refinance (see above). Make some kind of assessment on their ability to continue to pay, as we normally would, and if they can’t then let the chips fall where they may…not spend more tax payer dollars. And finally, I’m not sure what the stated goal of this lawsuit/settlement is but I sometimes wonder if the attempt is to help out the housing industry or simply to act as the stimulant that I mentioned above. Yes, some of the things would seem to indicate that they are trying to prop up or prevent a continuing slide in prices but in the end I think much of the thought behind this is to free up the cash each household can spend and thus boost the spending they do elsewhere…versus having the banks take it all (in the form of mortgages that are at relatively high rates) and do what they do best with it, which is enrich their executives with alarmingly high salaries and bonuses…many of which were on the watch for the past 10 years while things went to hell. Unlike many pundits (nobody cares what I say so I don’t think I’m a pundit) at this point I don’t believe we need the housing market to recover in order for the overall economy to recover. I think we’re already seeing that a recovery can take place while that industry is still having a great deal of trouble. Of course that recovery isn’t as strong as it would be with housing being a part of it but at some point the larger economy will discount that need and will move on so to speak. And those committed and established individuals in the mortgage and real estate industry, such as yourself Logan, will be just fine in a contracted line of business because you’ve done things right and continue to do so. 1. In regards to refinancing borrowers under water. My 2nd article I wrote as a columnist back in 2010 was to create such a program and I have written other articles asking for such a plan for qualified responsible homeowners. If we were going to spend Trillions of dollars to get mortgage rates low we should allow qualified responsible home owners all over the country to take part of it. However, the refinance programs are coming in way late in my view. Refinance 2.0 is structured ok, because Freddie and Fannie own the paper so the risk isn’t there at all. I know investors will get the shaft, however this wasn’t going to be a perfect plan. If this was created in 2009 and 2010 we could have seen some money back into people hands already and in the system. Obama 3.0, I like the concept but it wasn’t designed the way I would have liked. I am not sure if that is even going to pass congress. In regard to principal write downs, I have always stated in my blog and posts that you will never see a nation wide write down policy ever. The money Freddie and Fannie would need for this would be too high and it would never pass congress. The lawsuit, welcome to politics 2012. This is why I predicted this deal would close in 2012 and not 2011. The State A.G. had the banks by the balls and were going to get money for people from it. It’s good politics for them and the banks really did a dumb thing by speeding the foreclosure process by forging signatures. This is why the banks didn’t fight the deal too much. There are no pundits in housing. Think about all the so called experts you have seen on TV from 2009 calling the housing Bottom year after year after year.